Our client, The Golden State Warriors, provided us with two signed jerseys so that the viewer could see each side of the jersey in the frame. We attached the jerseys with invisible thread onto a cream rag board backing and separated them from the glass using a box mat. The design was topped off with a deep gold frame from Orr-Bay Moulding and ultraviolet reflecting acrylic. 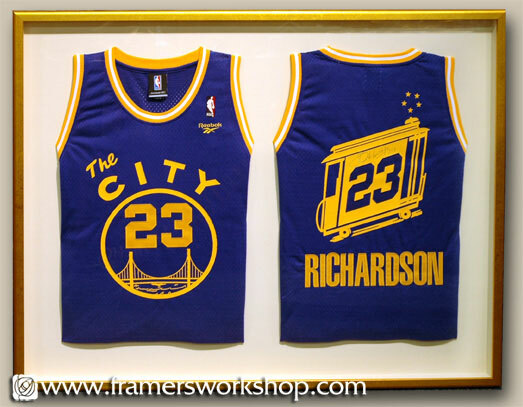 For jersey frame pricing see our Discount Framing Page.